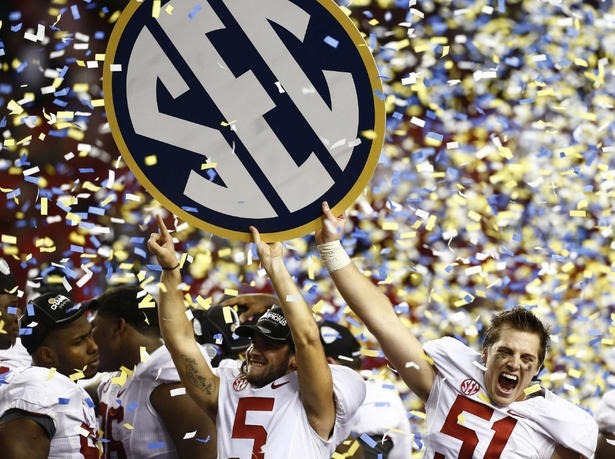 As the Alabama Crimson Tide football team gathered in Birmingham for its annual banquet to not only celebrate its SEC Championship and season as a whole, but also to receive confirmation that the Tide will be playing Notre Dame in the BCS National Championship, there were also some personal awards to give out. Offensive lineman Barrett Jones, offensive lineman Chance Warmack and defensive lineman Damion Square were named team captains and will have their hand and footprints planted in cement near Denny Chimes at A-Day in 2013. Here is a list of the other awards and the players who received them. Linebacker C.J. Mosley. Mosley led the team in tackles by a longshot with 99, towering above Trey Depriest, who is in second with 56. Mosley also tied the school record for career defensive touchdowns, with three. Mosley’s interception and 16-yard touchdown return against Michigan was his third, tying the mark set by Antonio Langham (1990-1993). Running back T.J. Yeldon, kicker Cade Foster, H-Back Kelly Johnson and defensive lineman Jesse Williams. Wide receiver Kenny Bell, defensive lineman Quinton Dial, long snapper Carson Tinker (pictured left, 51), linebacker Xzavier Dickson and place kicker Jeremy Shelley (pictured left, 5). Barrett Jones and Chance Warmack. Defensive lineman Jeoffrey Pagan, defensive lineman Ed Stinson, offensive lineman Cyrus Kouandjio and offensive lineman Anthony Steen. Denzel Devall has quite the future ahead of him if he turns out like the guy C.J. Mosley thinks of when he sees Devall. Find out who that is and more in my practice notebook. I was able to spot a NFL general manager at football practice today. Who was it? Find that plus who had attention paid to their ankle and more in my Quick Hitters. Alabama has now lost two more players for the rest of the season to knee injuries. After losing Jalston Fowler in the Western Kentucky game, DeAndrew White and Dee Hart also had season-ending knee injuries in the most recent win over Ole Miss. 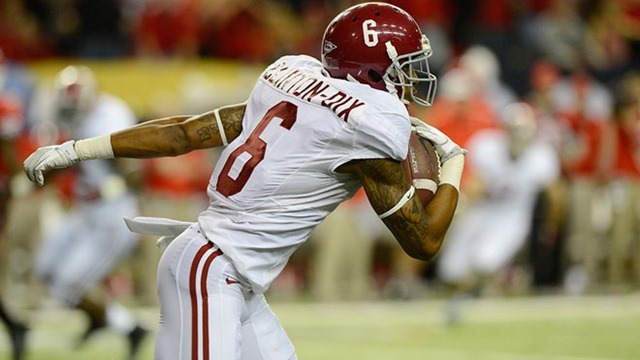 At wide receiver, Alabama now has Amari Cooper, Kevin Norwood, Kenny Bell and Christion Jones. Cyrus Jones is the leading candidate to be the first one on the field to substitute, and Danny Woodson Jr. and Marvin Shinn could also see playing time. 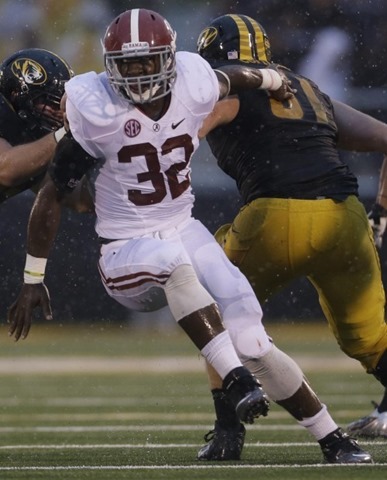 Alabama is now down to three running backs: Eddie Lacy, T.J. Yeldon and Kenyan Drake. Head coach Nick Saban led his team to Bryant-Denny Stadium yet again for its second scrimmage in spring practices, the last one before A-Day. There were some interesting depth chart moves displayed that I will detail for you while we await the end of the scrimmage. Redshirt freshman Brent Calloway had been tried out at RB and LB last season, and has now been seeing reps at the tight end/H-Back position. We have heard that his transition there is going well, although he still remains behind the names that were prevalent going into this spring: Michael Willaims, Harrison Jones (brother of Barrett) and Brian Vogler. However, he is beginning to step ahead of some smaller names at those positions, like Malcolm Faciane and Tommy Keys, so Calloway could potentially keep working his way up the depth chart at TE of H-Back. At wide receiver, early enrollee freshman Chris Black is keeping his spot relatively high on the depth chart (in the top 5) despite the return of DeAndrew White, coming back from a recurring hamstring problem. To make it easier, I’ll list the depth chart as it appeared two weeks ago and what it looks like now (with changes in italics. Two Weeks Ago: Kenny Bell, Kevin Norwood, Marvin Shinn, Christion Jones, Chris Black, Danny Woodson Jr., Amari Cooper. (White out with hamstring issue. Now: Kenny Bell, Kevin Norwood, DeAndrew White, Christion Jones, Chris Black, Amari Cooper, Marvin Shinn, Danny Woodson Jr.
Notes at WR: Cooper is clearly catching up with his classmate Black, both of whom are now within striking distance of legitimate regular season playing time. White seems to have not missed a beat in coming back from his injury. Tough decline for Shnn and Woodson Jr. Tune back in a few hours for stats and post-scrimmage quotes. The bossman at the Crimson White told me to go to spring practice yesterday and Coach Saban’s ensuing press conference, so I did. Here’s what became of it.